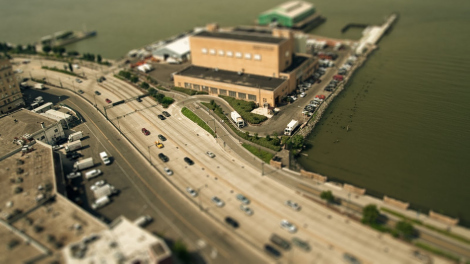 Every wonder what NYC would look like if it were a miniature set? Well, through the use of Tilt-Shift Photography (and 35,000 images), Director Sam O’Hare from Aero Film has accomplised this with his short video called The Sandpit. Using the camera’s tilt forselective focus (blurring everything that is not the primary focal point), the effect simulates a miniature scene. And thousands of images stitched together gives you what appears to be video footage. What really grabbed me about this piece was the music, a piece I don’t even know the name of, co-written by Rosi Golan and Alex Wong of the music production house Human. Not even sure where you can even hear the track outside of the video, but it’s really nice and fits picture perfectly.